Mr Satyarthi along with an assembly of global leaders conceptualised the International Commission on Financing Global Education Opportunity, last year, to support this vision. 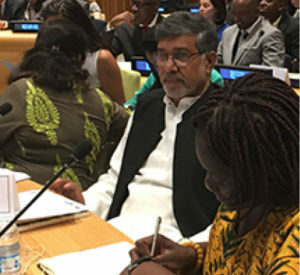 The Learning Generation: Investing in Education for a Changing World was unvelied on September 18 at the UN Headquarters in New York and was attended by the commissioners of the Education Commission, including our Founder and Chairperson Mr Kailash Satyarthi. The report is the culmination of a year-long analysis and global consultations to mobilize resources towards achievement of quality, equitable and universal education as enshrined in the UN Sustainable Development Goal 4. “Education is a human right and a universal good”, Kailash Satyarthi spoke at the launch.He highlighted that the consequences of education crisis are visible in the 150 million children engaged in child labour today. At the same time he said there are another 150 million children living on streets. “The promise of education for all can end child labour, child marriages and all forms of violence against children,” the Nobel Laureate said. To the members of the Commission and audience, presidents, prime ministers and global leaders, he noted that the right to education cannot be realised without ensuring the right to freedom for every child. The Commissioner stated, “Freedom from child labour and child marriages, freedom from slavery and trafficking, freedom from fear and abuse and freedom from discrimination and violence are must to bring and retain children in classrooms. Today, 263 million children and young people are out of school and the number of out-of-school primary-age children is increasing. The report shows that more than 1.5 billion adults will have no education beyond primary school in 2030. Mr Satyarthi spoke about investing beyond education to tackle factors preventing learning. Highlighting the plight of millions of children deprived of education and learning due to child labour, child slavery, child marriage and other socio-economic reasons he put forth the agenda of the most marginalised children in education financing. He recommended that governments develop and implement a holistic, cross-sectorial strategy to reach marginalized populations and narrow equity gaps, including promoting community action and advocacy to challenge norms and support local change; innovating to include; and underpinning inclusion efforts with national legislation and international action. The Education Commission concluded that it is possible to get all young people into school and learning within a generation – despite the scale of the challenge. The Commission is challenging development partners to rally behind this bold vision. 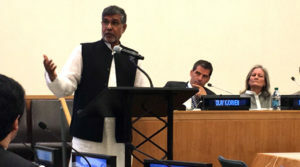 Mr Satyarthi added, “We cannot undermine the necessity of freedom to achieve education. Denial of freedom and education is violence against children… Child labour is the biggest travesty and scandal of our times. Freedom for education and education for freedom should be our motto.